Attracting a lot of interest, the Yizumi UN260A5 is available in our showroom for immediate despatch. Its popularity is unsurprising; combining high efficiency with reliability, the machine is both powerful and user-friendly. Come and take a look – we welcome showroom visits, just let us know you’re coming. Like the sound of it? Read more about the A5 series here. STV Machinery have been very successfully refurbishing and selling injection moulding machinery all over the world since 1999. In that time we have gained valuable insight into the makes and models of injection moulding machines which have the most second hand appeal to processors. Arburg 25 – 100T with Selogica controller. Arburg are of course one of the top machinery manufacturers and their Selogica controller is well known and very popular. These particular machines are compact, reliable and very much in demand. BOY Injection Moulding Machines with Procan micro-processor controller. 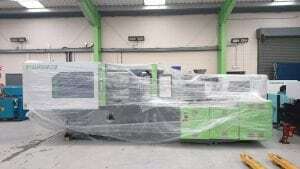 Engel Injection Moulding Machines 25t – 120T. Krauss Maffei 100 – 250T. Very high quality injection moulding machines and not as common on the used market as some other German manufacturers. Machines in this size range are sought after as Krauss typically offers great tie bar spacing and platen areas. The direct lock technology of Krauss Maffei machines means they have a desirable footprint for a larger tonnage machine. Demag Ergotech Injection Moulding Machines with the NC4 controller. The NC4 controller is easy to use and rated highly by many customers. Demag offer a very large range of machinery and a lot of customers standardise to have Demag only mould shops. If you have any of these machines or any other makes or tonnages that no longer meet your production needs and would like to sell them, please contact us to discuss how we can help you. Alternatively, if you are looking to purchase a refurbished injection moulding machine, no matter the manufacturer or tonnage we can help.